Hello, I'm Gregor and I put this site together. 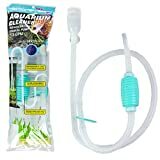 At first, you'll find an overview of recommended aquarium gravel cleaners, followed by a public poll and a general buying guide on aquarium gravel cleaner. 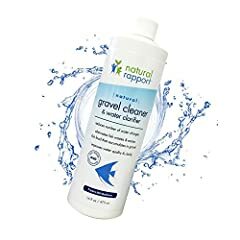 Further down on this page, we do link to other well-written articles and reviews about aquarium gravel cleaners. At last, you'll be able to weight in your own opinion in the comments section. If you also want to vote on the best aquarium gravel cleaner, click here to view the poll. A clean aquarium adds relaxing beauty to any home or office, but without regular care, it can become thick with unhealthy debris. As part of a regular maintenance schedule, cleaning the gravel in your aquarium keeps the water clear and reduces the time between water and filter changes. Gravel cleaners are inexpensive and simple to use, but understanding the role of gravel in your aquarium and how cleaners work is essential to choosing the best model for your needs. Gravel isn’t an absolute necessity in an aquarium, but it performs three important functions that make it a desirable addition to your tank or fish bowl. First, it’s aesthetically appealing. Gravel in hues that make the color of your fish pop enhances the beauty of the aquarium and makes an attractive landscape in which to add plants and other decorative features. Water stays looking cleaner longer as large particles of excess food and fish waste fall to the bottom of the tank where they are trapped within the gravel. Next, it helps create a more natural habitat for your fish by providing a base to nestle in while the plants and decorative features anchored in the substrate give them a place to hide from other fish or ambient light when they’re feeling stressed. Finally and most importantly, gravel provides a home for beneficial bacteria that help control the build-up of ammonia and nitrate waste products in the tank. Without gravel, water needs to be changed more often. If a certain amount of debris in the gravel is necessary for beneficial bacteria to thrive, it may seem counterintuitive to remove it, but when too much builds up, it can lead to an overgrowth of harmful bacteria. It’s all about balance. Gravel cleaners effectively remove enough large particles to keep water clean and preserve the filter, but leave enough behind to maintain biological equilibrium. The simplest gravel cleaner looks like a cat litter scoop. It’s simple and removes no water, but as the scoop moves through the gravel, it catches only the largest particles of debris while allowing smaller particles to float freely, clouding the water. It’s the easiest to use, but the least effective. Most popular gravel cleaners work like siphons. A large, empty plastic tube is inserted into the gravel and as water flows from the bottom of the tube through a hose and into a bucket outside the tank, debris is removed with it. Some models come with a faucet adapter that allows water to be drained directly into a sink, eliminating the need for buckets. Other filters don’t remove water. Instead, they work like a vacuum, sucking in water and trapping debris in a fine mesh filter while returning clean water to the tank. They’re hand-held, battery-operated, and are an excellent choice for hassle-free cleaning without messy buckets. Just rinse the filter after use and you’re done, but if you also want to replace water, you will have to siphon separately. Most vacuum-style gravel cleaners must be fully submerged in order to function properly, so the tank must be as tall as the unit. Most are not equipped for tanks less than twelve inches high. For smaller tanks, look for a less common, but non-submersible version. Since this type of cleaner doesn’t remove water, the diameter of the tube isn’t important. 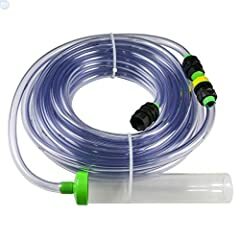 With siphon-style cleaners, the larger the diameter tube that goes into the gravel, the faster water siphons. 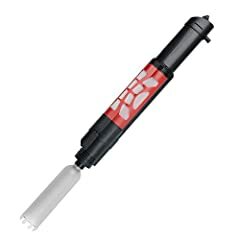 A large tube will remove water from a small tank faster than its floor can be cleaned. Tubes come in sizes as small as one inch for fish bowls and mini tanks up to two and a half inches for large tanks. A tube with an inch and a half diameter is common for small to mid-size home aquariums. 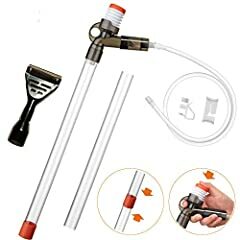 Original siphon-style gravel cleaners work like any other siphon. After placing the large end of the tube into the gravel, the water flow is initiated by sucking on the other end of the tube. These are still available, but the good news is that newer designs use an integrated suction bulb to start the flow. 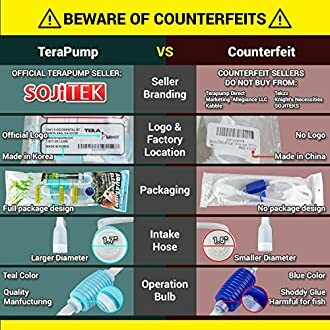 Suction bulb design and placement vary and most are equally effective; however, bulbs with shallow ridges or without ridges are easier to squeeze and will be more durable. Those that are deeply indented like accordions have more seams and are more likely to crack sooner. Siphon-style cleaners all work the same way, but some have convenience features that make them easier to use. For styles that drain into a bucket, the most valuable feature is a clip that keeps the end of the tubing securely in the pail. This makes gravel cleaning a truly one-handed operation without fear of spills. 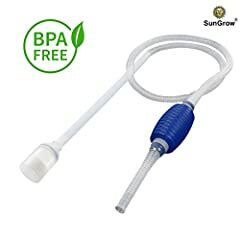 Cleaners that drain water directly into the sink via a faucet adapter are less messy and may also allow fresh water to be added to your aquarium, eliminating hand-pouring. The drawback is that unless your aquarium is located near a faucet, extensive tubing will be needed and your gravel cleaner may end up being as large as a garden hose. 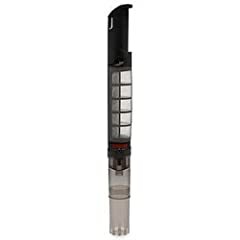 For vacuum-style filters, look for permanent filters that are clog-free and can be easily cleaned after each use. Some models have a bag-type filter that is effective, but hard to clean and prone to clogging. 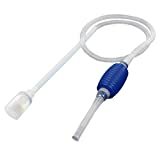 For most small to mid-sized home tanks, an inexpensive siphon cleaner with a bulb suction device and a one to one-and-a-half inch tube is quiet and with practice, is easy to use, clean and store. The water changing process takes a little time, because the tank is small, there should only be one bucket of waste water. Larger diameter siphons are effective for large tanks, but needing multiple buckets to collect waste water and manually dumping them is a messy chore. For gravel cleaning without removing water, a vacuum pump costs a little more, but will take less time and be easier on your back. 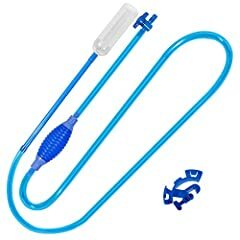 For cleaning and water changes, a siphon style cleaner with a faucet attachment is ideal. Scoop type filters might look appealing for their familiarity and simplicity, but are not very effective and not recommended. - Choose kink-free tubing for hassle-free cleaning. - Look for tube ends that are oval to make reaching into corners easier. - Make sure the model you choose has enough tubing to reach from the aquarium to the floor. To siphon, the catch pail must be below the level of the aquarium. 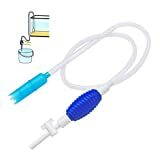 - For styles that connect directly to the sink, look for a water-filling feature. - Buy a model that accommodates extension tubing in the event the aquarium must be moved. - Choose a size that effectively cleans the bottom of tank while removing less than 25% of the water. - Always choose materials that are BPA-free and rinse tubing thoroughly after each use. Cleaning gravel once or twice each week will keep your tank healthy and clean. Just run the siphon or vacuum tube along the bottom of the tank, gently stirring up the gravel as you go. No matter the size of your tank, it’s the one essential step to making overall aquarium maintenance simple and stress-free. New: Our editorial list of additional articles. 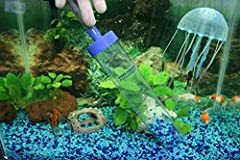 We decided to gather informartion all around the internet and present you a list of helpful, external links to interesting reads about the best aquarium gravel cleaners and their reviews and guides. You're not convinced by the previous writings about aquarium gravel cleaners? Of course you can just choose by visual impression, that's why we present you all our chosen products at a single glance. A click on any image is enough to open an external link to the best offer we could find. 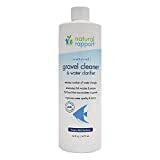 Today - Cobalt Power Gravel Cleaner Review and GIVEAWAY! KGTropicals!! Finally, we want to present you our rating criteria for our aquarium gravel cleaner comparison, so you can better understand and comprehend our recommendations and the rating process itself. Furthermore, we still ask you to keep your eyes open for short term deals in order to make some great bargains with aquarium gravel cleaner in 2019. Published by G. Krambs on StrawPoll.com (last update on 2019-04-18 08:52:21). 6 of 8 readers found this article helpful.